Unrivaled new satellite data combats illegal fishing and transshipment in exclusive economic zones. Helsinki, FINLAND – January 22 – ICEYE, the leader in synthetic-aperture radar (SAR) technology for microsatellites, and Spire Global Inc, the world’s largest space-to-cloud analytics company, announced today a new collaborative technology to enable the detection of dark vessels and illegal activities at sea. This new service offering will give both ICEYE and Spire’s users a completely new satellite capability to assist in the detection and elimination of illegal fishing. The new product will assist in the detection of illegal transshipment and enable countries with a never before available level of visibility and awareness of vessels within exclusive economic zones. This new solution will also greatly reduce security threats and provide the industry a new way to monitor maritime trafficking. Detecting dark vessels that do not have their required AIS tracking turned on. In addition to detecting dark vessels, this technology partnership will allow users a new level of accuracy in tracking vessels involved in trafficking of everything from arms, drugs, commodities, and people that want to avoid being seen. With the economic value of illegal fishing estimated to be up to 23B USD annually, this solution was developed to directly address this combination of economic, environmental, human rights, and industry-wide security issues. The service will tap into Spire’s Satellite AIS (Automatic Identification System), which is currently used for continuous monitoring of vessels around the globe, in tandem with ICEYE’s satellite-based synthetic aperture radar imaging, which was designed to see dark vessels when they don’t report on their activity. Spire will utilize ICEYE’s unique ability to provide reliable, high revisit rates for radar satellite imaging, multiple times each day from anywhere on Earth, with imaging that functions through clouds at any time of day. This will allow both Spire and ICEYE to produce and provide a new data set of more substantial information at revisit rates never before possible. Squid fishing near the Exclusive Economic Zone (EEZ) of Argentina. 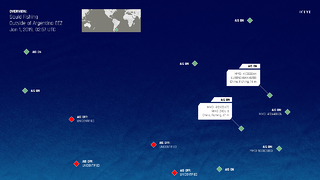 In the colored ICEYE-X2 SAR image above, there are Chinese squid fishing vessels that have their AIS tracking turned on, while other vessels have their AIS off. Without AIS, detected vessels remain unidentified. Argentina has been suffering from an increase in illegal squid fishing within its EEZ - the squid stocks are depleting and the available catch are decreasing in size. There have been incidents where the Argentine Coast Guard has had to take reactive actions against illegal vessels. This new dark vessel monitoring service from ICEYE and Spire brings systematic monitoring for cases such as this. Spire has become an industry standard for data collection in the commercial aerospace sector and operates one of the largest constellations of private nanosatellites and ground station networks in the world. The company has also launched strategic partnerships across a myriad of verticals including deals with NASA, ESA and key players in the weather, maritime and aviation sectors. ICEYE successfully launched its second SAR satellite, ICEYE-X2, on 3rd of December, 2018. The satellite launch is an initial step to creating the necessary SAR satellite constellation of ICEYE for frequent and reliable satellite-based information about any location on Earth. ICEYE is establishing the Internet of Locations to support vast economic growth in Finland in the various parts of generating, analyzing and consuming satellite data for operational uses. Join us on February 12th, 2019 at 8:00 am PST (11:00 am EST, 5:00 pm CET) for an ICEYE + Spire webinar “Fusing AIS Data and SAR to enable global monitoring of dark vessels,” to learn about the ICEYE + Spire collaboration and how it is enabling the detection of dark vessels and illegal activities out at sea. 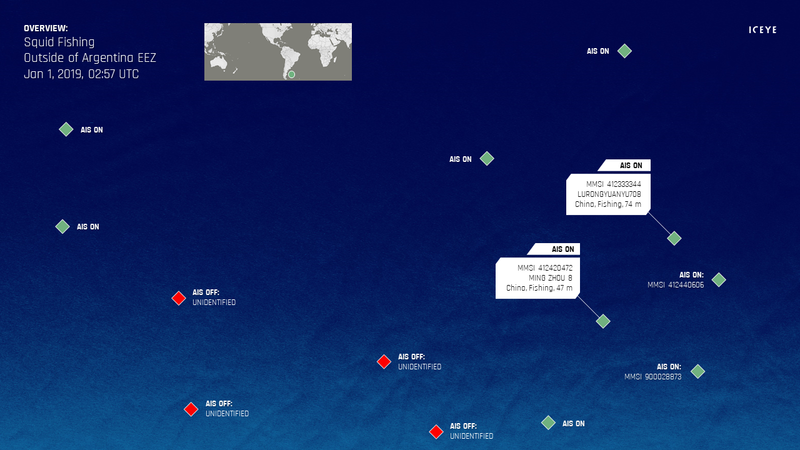 Spire's Satellite AIS is used for continuous monitoring of vessels around the globe. 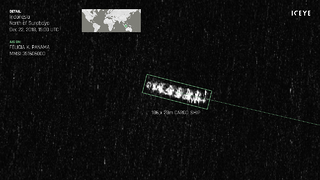 ICEYE's radar satellite imaging is used for seeing dark vessels when they don’t report on their activity. Other assets available at https://www.iceye.com/press. "An identified cargo ship North of Surabaya, Indonesia on December 22, 2018, 15:00 UTC." "Squid fishing outside of Argentina Exclusive Economic Zone (EEZ) on January 1, 2019, 02:57 UTC." "SAR + AIS data fusion from ICEYE and Spire." ICEYE’s mission is to enable everyone to make better decisions based on timely & reliable Earth Observation data. Get the latest news and updates from ICEYE directly to your email. Don't forget to follow us on @iceyefi & on LinkedIn. For press inquiries and further materials please refer to our Press section.